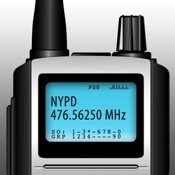 Tap into the largest collection of live police, firefighters, aircraft, railroad, marine, emergency, and ham radios. Be the first to know about important news, events, or the first to know about any major crime waves happening in your town. Localized police codes - Now you can understand the police language that is specific to your city/county. Feeds/Codes for all 50 U.S. States, Australia, and others are included. New police feeds and others are added on an hourly basis. Visit http://smartestapple.com/skins to download new skins for free. - Listen to feeds in the background. You can run other apps while listening to the police. - Listen to feeds on your desktop/laptop computer. Email yourself a link to the feed, and open that link on your browser. - Brand new built-in Web Browser allows you to browse the web while listening to a feed in the background. - The web browser blocks most ads. - Share feeds with your friends by email. They do not need to buy this app to listen with you. - Worldwide coverage. Although, we may not have your country covered, our app is always expanding and looking for new police radios to tap into.